I can't pass up a jelly doughnut. In fact, every time we go to Krispy Kreme we get two dozen doughnuts. One dozen glazed and one dozen that have to be to be filled - lemon, raspberry, cream, pudding, you name it. 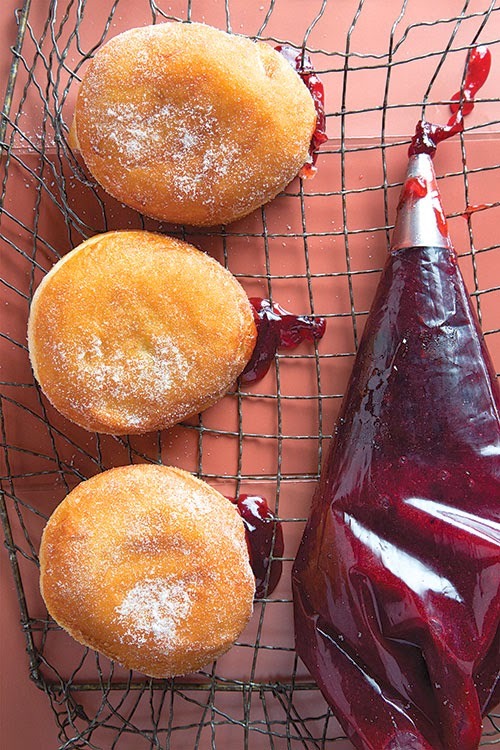 So when a jelly filled doughnut recipe found me on Pinterest, I knew I was game. I had previously mastered the homemade glazed yeast doughnut and it was time to tackle the filled doughnut. Taking on the filled doughnut was surprisingly easier than I had thought. I already knew how to make a yeast doughnut so that didn't intimidate me. I fried these just as I would the glazed doughnuts, too...just no holes. Filling the doughnuts was a little messy, but not too bad. It was actually a lot less messy than glazing a bunch of doughnuts (an excuse to make filled doughnuts instead). We did wind up with some odd looking ones - those that were made from dough during the second rolling and cutting. You can see The Boy's reaction. Yep, he liked them, too. They did taste surprisingly similar to Krispy Kreme's jelly filled doughnuts but wasn't as "light and soft" as Krispy Kreme's. Apparently, that required almost no handling of the dough. The recipe made 20 doughnuts. I put half of them (unfilled) in the freezer for a later date. I just couldn't see us eating all 20 doughnuts. Well, actually I could see it and it wasn't a pretty picture but I also wanted to try filling them with lemon curd or vanilla pudding later without having to make a whole new batch. This recipe has definitely made it onto our "make again" list. Get the recipe on Saveur.com.